duik een stevig bakje mierzoete thee en lekker kletsen rond het kampvuur. gaan wonen: Dahab blijft speciaal. Een oase in de Sinaï. Het CDWS (Chamber of Diving and Water Sports) is fel tegen het besluit van de Zuid Sinaï regering die groen licht heeft gegeven voor commerciële visserij. Vissers zouden vrij mogen vissen in één van de meest beroemde onderwaternatuurreservaat in de wereld; het Ras Mohamed National Park. DIVE magazine publishes the news online about the decision of the South Sinai Governor to allow commercial fishing in Ras Mohamed and CDWS call to take immediate action and reverse the decision. habilitado para acreditar competencias profesionales. Le président de l’Organisation “Padi” pour la formation des plongeurs Jack Lavanchy a déclaré que l’Egypte a réussi à transformer les projets de plongée et des activités marines de l’aspect individuel à celui institutionnel tout en créant une industrie solide dans seulement trois ans. 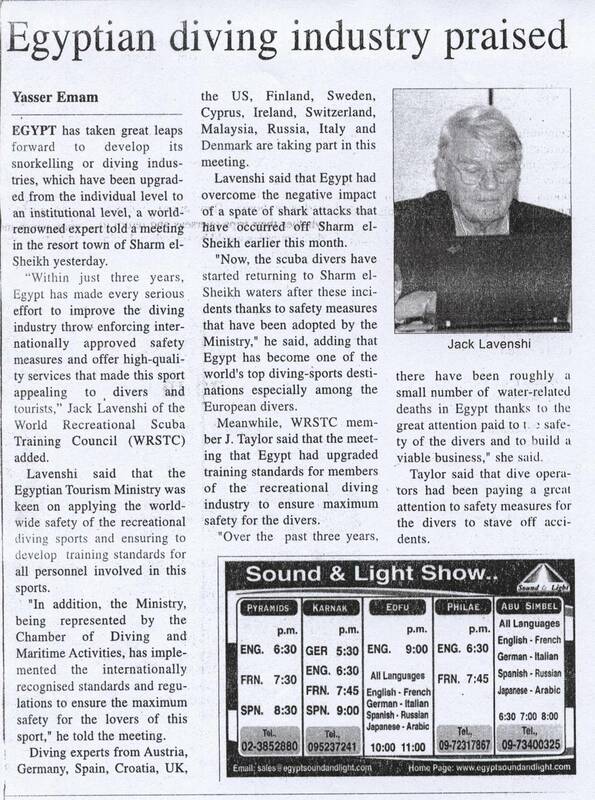 Jack Lavenshi, of the World Recreational Scuba Training Council (WRSTC), praised the Egyptian diving industry during a meeting in the resort of Sharm el Sheikh. Zeyad M. el-Bassel, Managing Director and spokesman of CDWS, is interviewed by the Egyptian Gazette. Swiss magazine Nereus talks about the role of CDWS in Egypt. Easyjet's Traveller magazine sends one of his journalists over to the Red Sea on a Learn to Dive adventure. Mondo Sommerso publishes the news that CDWS can confirm all member diving and watersports centres are operating as normal in the resorts of El Gouna and Hurghada following the oil spill in June 2010. 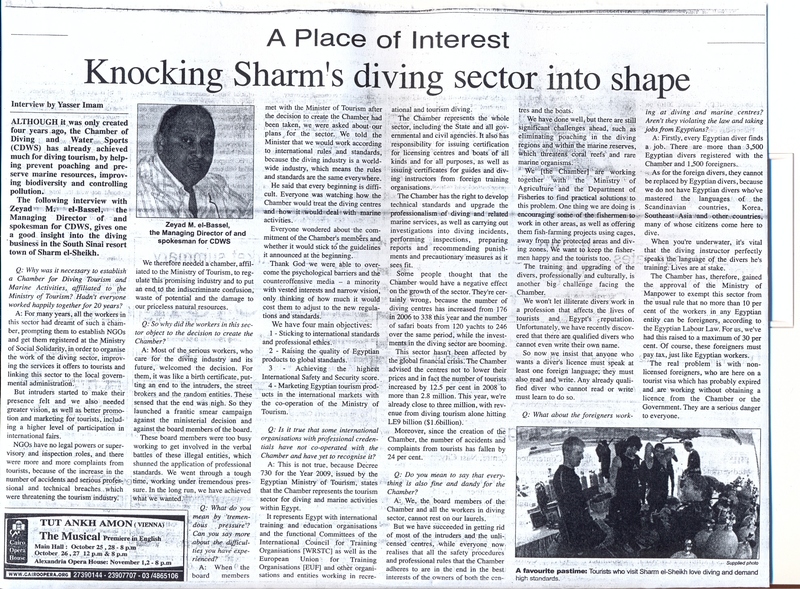 Diver magazine reports on the efforts made in Egypt regarding illegal fishing and the role played by CDWS. Norwegian Dykking magazine publishes the news of Capture the Catcher campaign. InVertum magazine from Russia publishes the CDWS Capture the Catcher campaign. Interview mit Hesham Gabr, dem Vorsitzenden der CDWS. Относительно недавно, египетские власти решили предпринять новые меры по повышению стандартов безопасности дайвинга и качества услуг дайв-центров. В этой связи, Палата дайвинга и водного спорта Египта (CDWS) начала плановые проверки всех действующих на красноморских курортах дайв-центров и прогулочных судов. Spain's Buceadores magazine highlight the work of the CDWS.